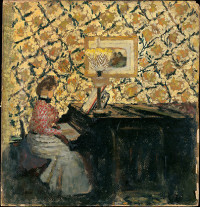 Édouard Vuillard was born on November 11, 1868, in Cuiseaux, France. He studied from 1886-88 at the Académie Julian and the École des Beaux-Arts in Paris, and in 1889 he joined fellow art students in forming a the Nabis, which is Hebrew for “Prophets”. 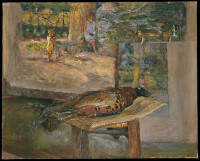 The Nabis were influenced by Paul Gauguin’s paintings from the time he worked in Pont-Aven in Brittany, and they were in favor of a symbolic rather than naturalistic approach to color. Their works emphasize the flatness of the canvas rather than the artificial three-dimensionality that could be produced with paint. 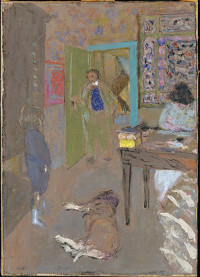 Many of Vuillard’s works reflect his home life; he lived with his widowed mother until her death. These interior domestic scenes are filled with rich patterns of wallpaper and textiles, typical of the Victorian era, and have a delicate intimacy about them. 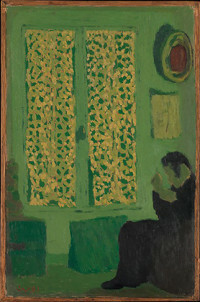 Vuillard also worked in book illustration as well as poster and theater design. 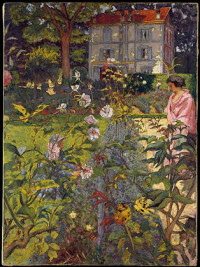 The last exhibition of the Nabis occurred in 1899, following this, Vuillard’s work took a more naturalistic turn. He painted numerous intimate portraits of friends and fellow artists and has public paintings at the foyer of the Théâtre des Champs-Élysées and murals in the League of Nations in Geneva. 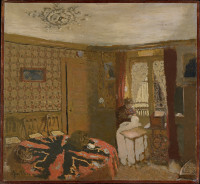 Vuillard passed away on June 21, 1940 in La Baule.